Today’s radical left has embarked on a quest to purge college campuses of their controversial histories. These “social justice warriors” not only believe themselves licensed to tear down statues—they view it as their sacred duty to rid universities of monuments that do not meet their standards of political correctness. But merely removing statues they deem to be offensive is not enough for these activists. Instead, they are demanding that campuses be remade according to their radical vision. This includes calling for the installation of new monuments and memorials to be erected that are more in line with the updated values they insist universities embrace. But what are these values? For modern campus activists, the overriding value for any social institution—including the university—ought to be diversity, which is defined entirely in terms of group identities such as race and gender. As part of their mission to implement this value, modern partisans of diversity seek to ensure that all favored identities are equally represented in campus statuary. But is the purpose of campus monuments merely to reaffirm one’s own race or gender? Surely more enduring principles ought to guide both the preservation and installation of campus monuments. Traditionally, they have been the transcendent ideals of the pursuit of wisdom and truth. But with today’s radicals, such transcendent ideals are targets, not goals. There is no better example of the activist crusade on campus memorials than at Duke University in North Carolina. In a recent report entitled “Activating History For Justice at Duke,” several students, staff, and faculty members documented the history of Confederate or “white supremacist” statues and mapped out their locations on Duke’s campus. The project’s goal is two-fold: First, the authors of the study hope to expose past and ongoing inequities at Duke by mapping out and calculating the disproportionate ratio of memorials of whites to those of minority groups. They argue that prior Duke officials ensured that white hegemony would be visibly memorialized on campus, while the stories of oppressed groups would go unseen and untold. White supremacy lives on through the bricks and mortar of our campus. Even though there have been recent efforts to take down some of these memorials, much more work needs to be done. More importantly, we need more memorials. Why are they here? What do they have in common? Number one: none of them have any affiliation to Duke University or the Duke family. Number two: they were all proponents of white supremacy. Robert E. Lee was an extremely cruel slave owner; Thomas Jefferson also owned a ton of slaves, but he was supposedly “less cruel;” Sidney Lanier was the least bad because he didn’t own any slaves—he was just a white [man] in the Confederate army. But to reduce figures such as Jefferson to a tool used by campus bureaucrats to enforce white supremacist values is intellectually dishonest. It is far more likely that Jefferson’s statue was put up because of his decisive role in the founding of this nation. As an American university, it is entirely fitting for Jefferson to have a place on Duke’s campus, for he was the Founding Father who was most concerned with education, particularly higher education. It is absurd to suggest that he was placed there merely to uphold the notion of white supremacy. It is also important to view history within context: keeping up a Confederate statue that has been in place for many decades is different from putting up that same statue now. That is because preserving such a monument does not entail an endorsement of the Confederate cause, but rather highlights the need for visual—and sometimes sobering—reminders of the past. However, historical monuments of Confederates or slave-owning historical figures do not even appear to be the greatest offenders. 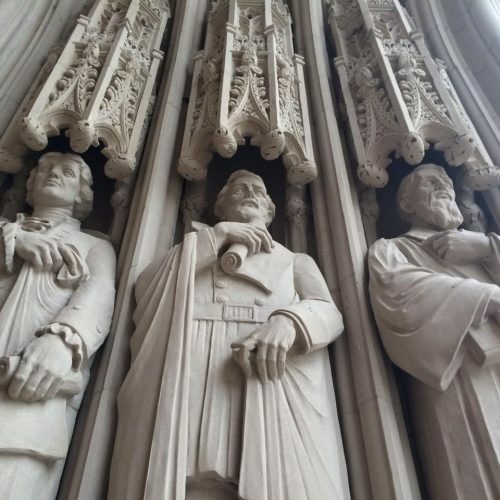 To campus activists, the more fundamental issue with Duke’s current monument landscape is that those memorialized are predominately white men. In the report, the authors decry that only 15 percent of reported monuments or memorials depict women, and worse, only white women. Currently, on our campus…the folks that are represented are primarily male and are primarily white. And that seems to indicate that there are no folks of color, that there are no women, that there are no poor folks on campus—and that just isn’t true. As a black woman, I would like to see myself, I would like to see my struggle represented when I walk around and engage with this space, because right now, I cannot feel at home if I don’t see myself. But why can’t students “see themselves” as part of the university’s legacy as a place of knowledge and enlightenment? Don’t they “identify as” part of a community of learning and thought, as the builders of the university imagined? The notion that the university isn’t fully living up to its academic mission because it doesn’t have an “equal representation” of race and gender in its memorials reflects a superficial understanding of the nature of an academic community. According to philosopher and art critic Roger Scruton, monuments should serve a transcendent purpose, one that brings people outside of themselves and beyond their immediate circumstances. In one respect, the activists are correct in that monuments should reflect the values of the surrounding community. As Scruton says, monuments are meant to give recognition to a person, event, or idea—but more than that, they serve to represent and uphold what the larger surrounding society values. For a nation, those values may be patriotism, honoring those who have sacrificed for that country’s protection, or remembering battles that were pivotal in the success of a war. But what are the shared values that characterize an academic community? Presumably, one goes to college to join a community of scholars where goods such as knowledge and truth are pursued. Because of this, the primary function of campus monuments ought to be inspirational, but also focused on inculcating shared academic values specifically. So it is reasonable that a university would want to honor alumni or individuals who made great discoveries or contributed to groundbreaking research. Also, private schools, in particular, may want to memorialize some of its generous donors—since they make much of the university’s work possible. Students should feel part of the university community because they seek to be scholars, thinkers, experimenters, writers, and rational beings capable of producing knowledge; not because they see their particular race or gender depicted in front of a manicured lawn. 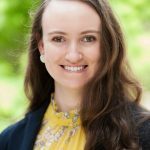 The simultaneous effort, however, to tear down campus memorials and put up new ones that toe the line of identity politics not only sets a troubling precedent for how future generations will reconcile with history, but it deprives students of the opportunity to aspire to ideals greater than the color of their skin.